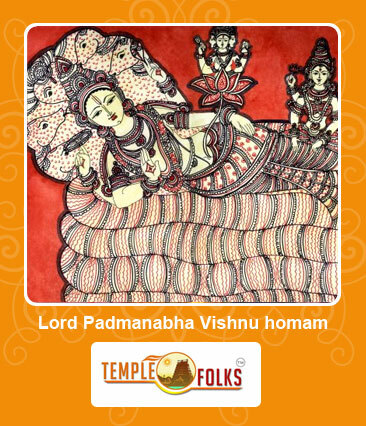 Padmanabha is another aspect of Lord Vishnu who has a lotus in his navel. It is believed that people who perform homam on god Vishnu will result in various benefits to live a better life. According to Vedic scriptures, anyone who is praying to Vishnu may overcome severe obstacles in life. In addition, it is possible to gain better prospects after performing certain rituals on Vishnu. Padmanabha Vishnu homam is a suitable one for those who want to achieve success, health, wealth and prosperity in their life. This homam also helps for improving the spiritual knowledge and wisdom to a wider extent. Lord Vishnu, the almighty god plays an important role in protecting devotees from evil forces and enemies. Padmanabha Vishnu homam makes feasible ways for preventing potential threats in life by addressing exact needs. Moreover, it helps for experiencing peace of mind from dosha and karma problems to live a peaceful life. Another advantage of this homam is that it allows a person to achieve goals quickly by meeting essential requirements. Anyone who wants to get the blessings and grace of Lord Vishnu can choose Padmanabha Vishnu homam for witnessing major advantages. In addition, one can be able to get relief from debts and other problems with this homam. Padmanabha Vishnu homam involves chanting of powerful mantras from Vedic scriptures to witness desired outputs. At the same time, it is essential to seek support from a leading Vedic consulting firm before organizing this homam. Vedic folks play a main role in this process to organize the homam with experienced Vedic scholars followed by fire rituals. People can also book the services through online for planning the event based on the birth chart reports.